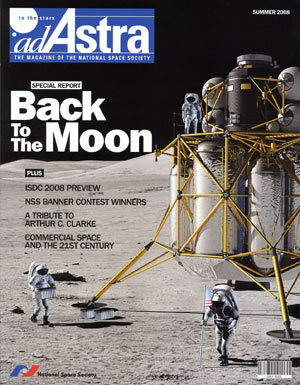 On The Cover: NASA’s Altair lunar lander looms large as its crew begins to explore the Moon in this artist’s rendering. 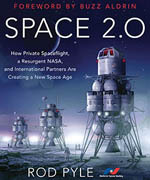 The space agency hopes to return crews to the Moon by 2020, and then begin establishing a permanent base there. Note: The entire Special Report on “Back to the Moon” (comprising the first five articles listed below) is available as a PDF file [4.3 MB]. NASA’s next great adventure awaits. An in-depth look at the Constellation program, the agency’s next generation vehicles and the similarities and differences from Apollo. 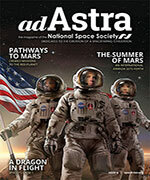 The reasons why NASA is going back to the Moon, and why the National Space Society supports the plan. After a decade with little attention, the Moon is suddenly back in the spotlight. Two new spacecraft are now in lunar orbit and others are nearing launch. A well-reasoned look at the logistics of a lunar outpost, and the implications for future habitation on Mars. Ten teams sign up to compete for the Google Lunar X PRIZE. Little more than 50 years after Sputnik I launched the Space Age, the heavens are opening up for private companies (and citizens). Vision, Policy, or Door Number Three?